A grand villa on the beach front and the quiet south coast of Koh Samui, this splendid property was recently built to a 5-star specification and awaits you and your party! Fully equipped for a maximum of 10 guests, it offers a large infinity-edge pool with Jacuzzi, private ocean frontage, and a second outdoor kitchen with refrigerated wine cellar and BBQ. 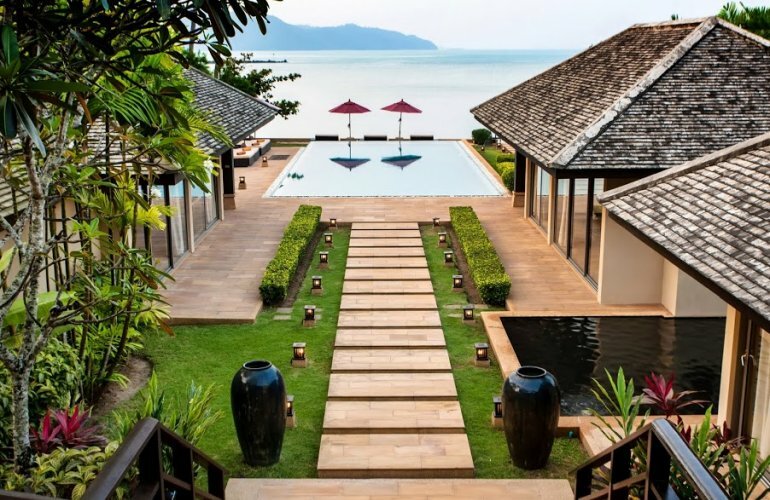 The ideal location for that really special holiday is the south of Koh Samui: quieter than the rest of the island, and yet still only 15 minutes drive from Nathon and Lamai, and 25 to the Santiburi Golf and Country Club and 35 minutes to Chaweng. This means that restaurants, clubs and evening entertainment are not too far away, yet when in your own beautifully landscaped garden and sumptuous villa, you are totally private and tranquil. On entering the villa at ground floor level, a walkway takes you across a pond via stepping-stones with fountains on either side towards an impressive Buddha carving, which bids you welcome to the main pavilion. On either side of the Buddha are doors leading to two of the villa's king size bedroom suites. On the upper level of this pavilion there is a huge double vaulted open plan living area where you will find a sofa-strewn sitting space, an entertainment lounge with 50" plasma screen satellite TV/DVD/CD system and surround sound, a dining area with a grand table able to accommodate 12 guests, and a full-equipped western style kitchen with an island breakfast bar. The living area benefits from the sea breezes when the large foldaway glass doors are opened, and has ceiling fans fitted. Superb sea views can be enjoyed from the wrap-around verandah, with Ko Tan and the distant mountains of the mainland on the far horizon. The large foldaway glass doors open up the living area to this outdoor verandah, and make it the ideal meeting place for your friends and family, from which you can all enjoy the stunning views, sip a cocktail or fruit juice, listen to music or relax inside watching a film. A wide sandstone staircase leads down from the living room to the swimming pool and ocean front pavilions, where a further three bedroom suites can be found. The right hand pavilion contains two bedroom suites, separated by a Koi carp pond, while to the left is the master bedroom suite, with a private lounge area, fabulous sea view and an extra large en-suite bathroom featuring his and her bath tubs, and an outdoor rain shower with wood deck. All the bedrooms in this villa are stunningly furnished, have personal safes, and have either polished wood floors or vaulted wood ceilings. Each bedroom has ample closet space in the built-in teak wardrobes, and sliding glass doors lead directly on to sandstone verandahs, furnished with sun loungers, beyond which are the landscaped grounds of the villa. Each en-suite bathroom has plenty of space, a sandstone floor, free-standing terrazzo bath tubs, twin wash hand basins and twin rain showers. All suites have plasma screen satellite TV/DVD systems and surround sound. The infinity edge pool is blue tiled and surrounded by sun loungers on a sandstone deck. A Jacuzzi is situated next to the pool. Just beyond the pool but before you reach the beach is a grass lawn furnished with more sun loungers and coracle love seats with shades. And on the beach front is a large sala pavilion, served by a second kitchen with BBQ and cooled wine cellar. Another good spot for those evening sundowners and al fresco meals straight off the BBQ!